The surveys include questions across the full range of end-user concerns – Business Sentiment & Outlook; Revenue: Current & Future Sources; Broadcast & Media Technology Procurement; Drivers of Product Choice; Impact of IT Technology; Broadcast & Media Technology Adoption; and Collaboration. Most respondents also predict that they will increase spending on media technology in the next twelve months, although their preferences continue to shift towards products and services that make their operations more efficient and agile. 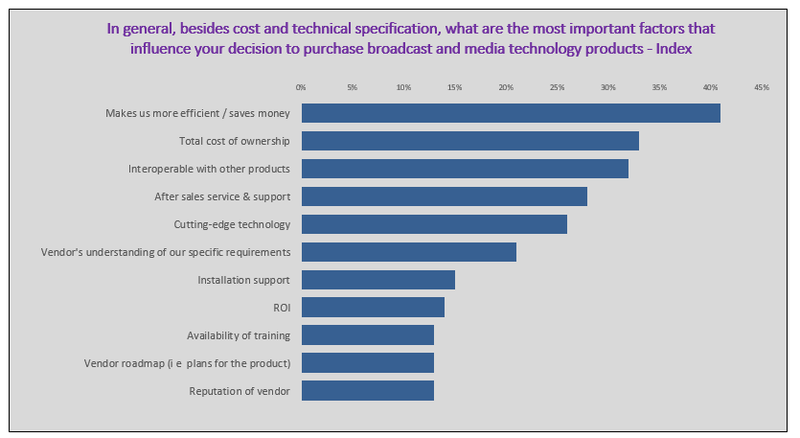 This is well captured by the chart below, which shows that the top three factors influencing broadcast and media purchasing decisions at customer organizations relate to efficiency, finance and interoperability. 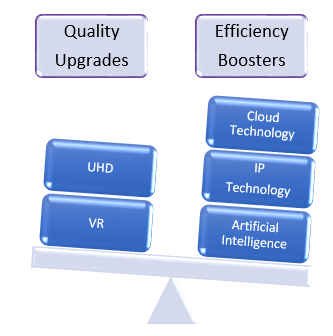 This focus on efficiency is accompanied by a decreased emphasis on quality upgrades such as UHD and VR. 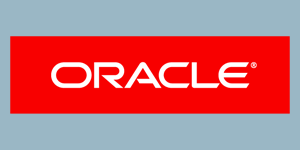 Although these are important for some buyers, they are generally considered as less important priorities compared to technologies such as IP and the cloud. The move to online media delivery, with many buyers looking at going direct-to-consumer – Disney has recently announced that it will do this – is having an impact on end-users’ priorities. With regards to this, media companies plan to increasingly streamline their operations in order to enable a swift transition to a multi-platform delivery model. In fact, this remains the top priority for most respondents of our survey, as shown by the next chart. Although 4K/UHD appears as the second most important priority for media technology buyers, a deeper look at the data (IABM members can access the detailed, 70+ pages of analysis by downloading the report from the IABM website) shows that this is actually important only for the production/post-production sector, where it is already established for content future-proofing. 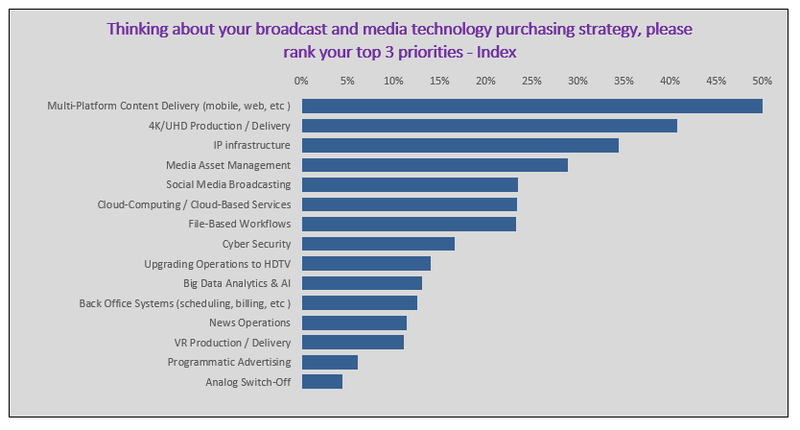 The highlight from the chart above was arguably the rise of IP into the top three priorities for media technology buyers. This is consistent with progress in the standardisation process coupled with an increase in the number of IP installations during 2017, with a few other projects in the pipeline for 2018. In fact, IP routing and networking equipment was (for the first time) the most in demand category of products for the next twelve months according to our survey respondents. Cloud technology was also high on the list. Similarly to IP, buyers are transitioning to the cloud to enable efficiency-boosting activities while being more responsive to market changes. According to our survey data, 37% of end-users have already deployed cloud-based solutions, with a further 55% intending to do so in the next 2-3 years. From an historical perspective, this is a record-high for cloud adoption, indicating that media technology users are becoming more aware of the benefits of it. While IP and cloud technology have been there for quite some time, artificial intelligence (AI) applications to the broadcast and media sector are just emerging – AI was also a big theme at this year’s IBC show. Although the adoption of AI is still at early stages, our survey shows that this has grown significantly in the last six months – between the NAB Show 2017 and IBC 2017 surveys. AI is potentially a panacea for end-users’ operations as it enables the automation of routine tasks such as content tagging, image recognition and speech-to-text. Particularly with regards to media asset management – the fourth most important priority for buyers – AI could be a game-changer, as shown by our more detailed analysis of AI adoption drivers. A last but not least important highlight from our survey was the decline in the importance of VR compared to our NAB Show 2017 iteration – third to last in the list of priorities above. This is consistent with the prevailing sentiment at the recent IBC Show. Buyers are generally worried about the slow rate of adoption of VR consumer equipment as well as the different characteristics of the VR experience. It is isolated and active – as opposed to the shared and passive nature of the traditional television experience. Another important caveat has to be made about the business models supporting the technology, which are still not clear. Evidence shows that most VR initiatives have not been monetized by end-users – this is consistent with our survey, as shown by our analysis of the business models to be launched in support of it. An exception is the partnership between NBA Digital and NextVR to deliver one game a week in VR, which was charged to consumers through a subscription model. Our full report contains a much deeper analysis of the results. These are analysed from both an organization type perspective, showing how different buyers have different preferences, and a historical perspective, showing how buyers’ priorities are changing over time. While IABM members can access the report free of charge, organizations that are not members can also download an overview or purchase the full report from our website. Media technology buyers’ technology infrastructures and business models are radically changing. Our End-User Survey aims at capturing this change in their purchasing preferences so that suppliers are able to meet them.